There is an increasing number of tools that you can use to create panoramic photographs. If you are not satisfied with the results given by your photo manager or if your favorite program does not offer such function, try CleVR. It is free and it allows you to use the finished panoramas in your web site using the embed mark. To begin with, let us explain what a panoramic photography is. In essence it means connecting several images into a single larger picture. If you want to take a photo of a broad landscape area for example, but you cannot get enough distance to fit the required area into one shot, you can simply take several photos of the individual parts of the area. Those photos should partially overlap so that the special software that will be joining them has some reference points. The best way to take the source photos for panoramic photographs is to use a tripod. Not all programs can deals with slight shifts and to join the images so that they are connected smoothly. In this respect I can recommend the excellent Microsoft ICE – it is fast and absolutely precise with different adjustment possibilities. Of course, it is free as well. The CleVR program and online service that I will introduce in today's article is also used to create panoramic photographs. What is more, it will allow you to upload the finished pictures to its storage – from there you can easily insert them into your own web site in a form of a new window with the possibility to view the panoramic photograph in its full size using scrolling. How to create a panoramic photograph using CleVR? In its basic form, CleVR is free. Such version allows you to create panoramic photographs as you wish, the only limitation is that you can share 50 images at the most. If you need to share more, you can use the paid version. On the other hand, many users are content with exporting panoramic photographs into JPEG. After registering and logging in using the password that you will receive in an E-mail message, click the install link. The operating application called CleVR Stitcher works in the Adobe AIR environment and its installation is a matter of several mouse clicks. Right after that the program is launched the login window is displayed, into which you will enter your login data. However, you do not have to login to be able to work with the program. 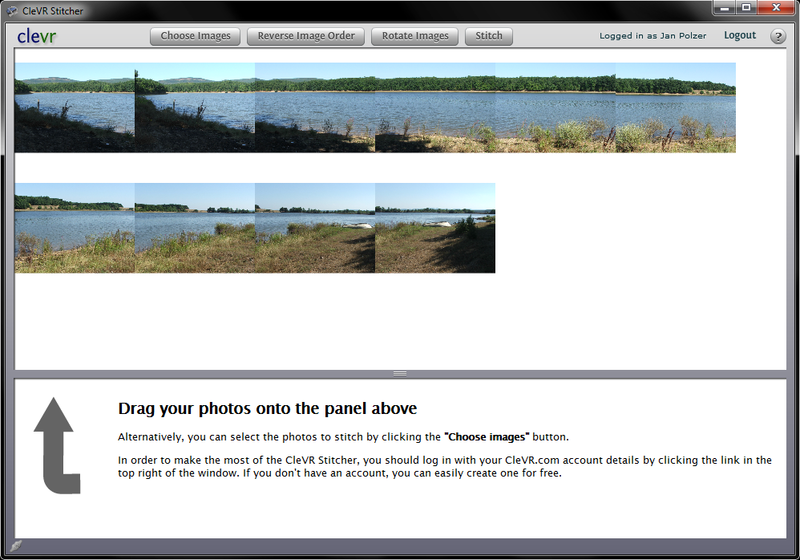 Click the Choose Images button and select the photographs that you wish to join in a panorama. Their sequence is not important at this moment, it will be decided after CleVR Stitcher has imported all the images. Now you can drag them using your mouse into the right sequence for the panorama. When the photographs are ready and in the correct order, click the Stitch button. CleVR Stitcher will now start creating the panoramic image, which might take up several minutes, depending on the number of photographs being joined and also on their size. To be honest, I must say that the program is slower than the aforementioned Microsoft ICE. After the panorama has been created, CleVR Stitcher will display a preview of the resulting image along with several buttons with different functions. Using the Enhance image slider you can adjust the color appearance of the image. You can choose from ten different coloring variants. If you do not want to upload the image to web, click the Export as JPEG button and save the panoramic photograph to your computer. 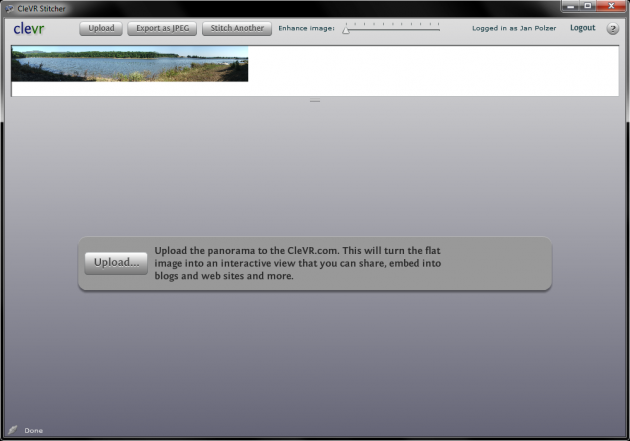 If you want to upload the panoramic photograph to web, click the Upload button and wait until CleVR Stitcher uploads the image. Then you will be able to view a preview in a form, in which the image would be inserted into your web site. By mouse dragging you can move the panoramic image in the window, you can also use the zoom buttons. 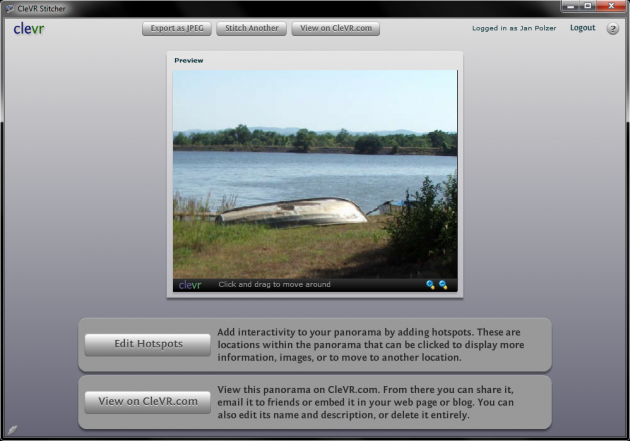 Click the View on CleVR.com button that will bring you to a web page with information about your panoramic image. Apart from other features you will also see the tags that you have entered while uploading the photo. Since they are in a link form, you can see what similar panoramas have already been uploaded on CleVR.com. Notice that in case of this panorama CleVR was not able to join the individual parts of the image absolutely precisely. The reason is that the images were taken without a tripod, which of course is not ideal. In places, where CleVR is not able to join the images precisely, it will solve the problem using a slight blur. In spite of this fact I must say that it is an interesting tool, mostly due to the possibility to upload the joined images to web.